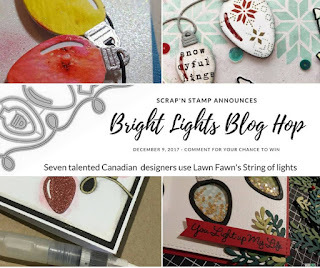 It is time to Blog Hop again with the Scrap n' Stamp crew! You likely arrived here via Karen's blog - and I am the final stop along the Hop this month! I am SOOooo excited that Christmas will be here before we know it - and I am busy in my studio sending off the last of my cards far & wide in hopes they arrive in time to spread some cheer! So it was wonderful to play with this fun & festive die from Lawn Fawn! 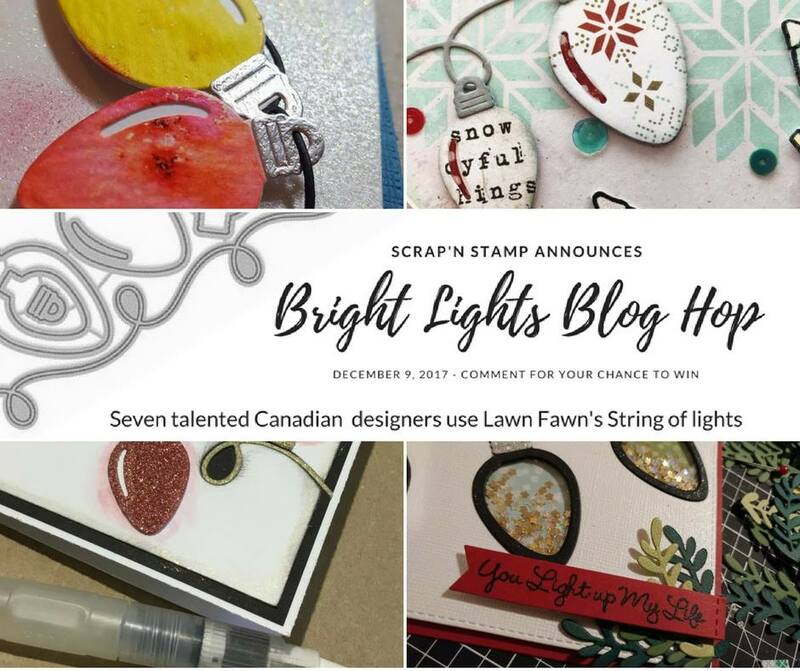 If you began here with me - check out what our SNS Blog Hop is all about - you can check out the Scrap n Stamp Blog with Tara! And now the BEST part! Be sure to leave a little comment below to let me know you stopped by - and your email addy - because we are giving away A BRAND SPANKING NEW LAWN FAWN SET for each stop along the Hop! Merry Christmas and hope to see you back in the New Year! So pretty! I love your colorful lights and the texture the color burst gave! I kept looking for you to list Glossy Accents! I don’t know why but your bulbs turned out so well and the bright white highlight popped so much on each one, I thought they were glossy! That’s one amazing optical illusion you’ve created. Gorgeous!! This is a beautiful card, Amber! Just so beautiful. Love it. Cheers. Great use of the Colorbursts, most people I've seen have only done backgrounds. The colours are so vibrant. You made a very pretty card! 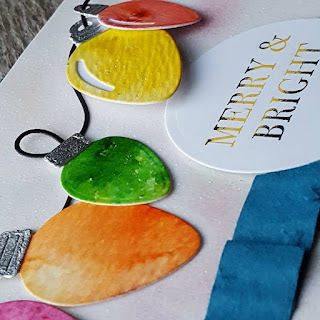 Your sentiment is perfect - these lights certainly are merry and bright! Such a cheerful card! Tara your card is a stunner and your bulbs look AMAZING. They really do look beutiful against the glittered background paper. A wonderful card! This is such a pretty card. Bright, colourful and a brilliant design using great techniques. Love the use of the color bursts on the light bulbs ... Alovely card! This is beautiful!! The Colorbursts look amazing! An awesome card...love the bursts of colours on the bulbs! 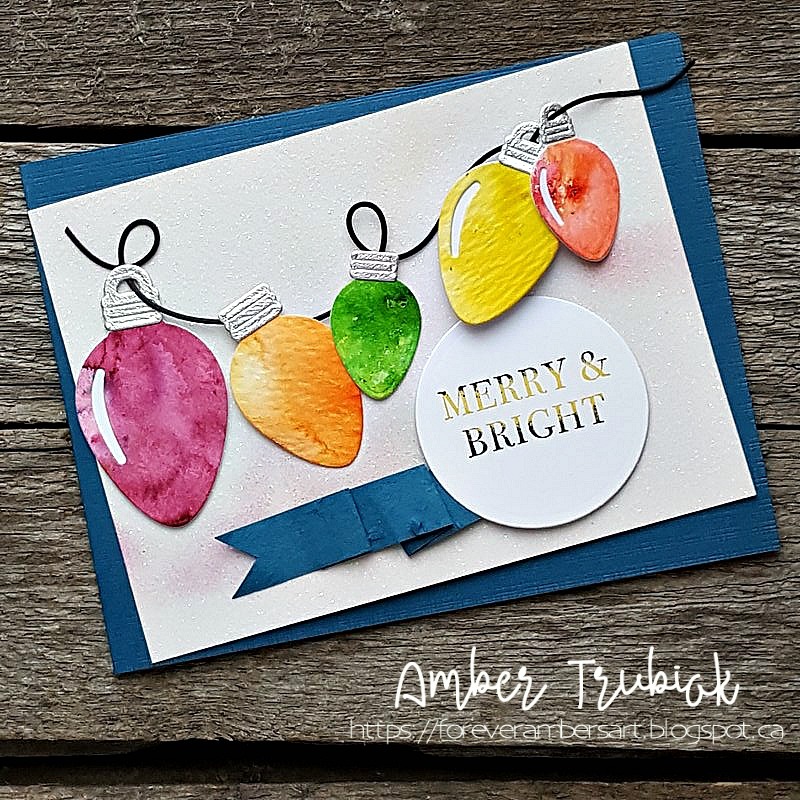 Beautiful card and use of colorburst! Color burst string of lights!!! Brilliant! I love your card! Beautiful card! I love the colors & textures of the lights and that they all look so different! Thanks for sharing! Thanks for reminding me of using my Brushos that are kinda similar to Colorbursts, Love those bright colors. Great card! Hi Aikun and yes - Brushos are almost identical! Love them :) Thank you for visiting ! Awww - you are so sweet! Thank You! Such a sweet card. Those colour bursts really give a nice effect. So pretty!!! The colors you chose are so perfect. Love it! Love the bright, festive colours used on your card. Thanks for the inspiration.